Even after several (ok four) decades in the Northwest, there are things I can’t quite get used to. I grew up in New England, the land of real snow. I remember horse-drawn sidewalk plows (really) and huge street plows that left piles higher than my head, even as a teenager. Here in the maritime Northwest, where snowplows are rare and drivers seem challenged by rain (which really is mysterious), a few wet inches of slush is cause for general panic. Today, however, caution is more appropriate: ice-slick streets are covered with slippery snow and the ditches are full of cars. Trees are falling from the weight of wet snow, and lots of folks are without power. Temperatures here rarely dip into the twenties, but we’re looking at about a week of below-freezing night temperatures so driving will be sketchy until a thaw arrives. Back in the day, my kids were ecstatic to have school cancelled. As young teens, they’d spend snowy mornings making huge snowballs and rolling them around the yard until they became immovable. I’d be out there too, releasing young trees from the weight of sodden snow, freeing bent boughs and straightening toppling trunks. I think the kids had more fun, though I once overheard the younger one admitting that he wished snow were warm instead of cold. His older sibling replied that we lived in the warm snow capital of the world–what did he think rain was? The younger retorted that you can’t make snowballs with warm snow, but the elder explained that water balloons were just warm snowballs…. Both kiddos agreed they would love to have a month of Montana or Vermont winter, but I’m glad we don’t. My friend Les Brake lives in Willow, Alaska, and deals with way more snow than I do. 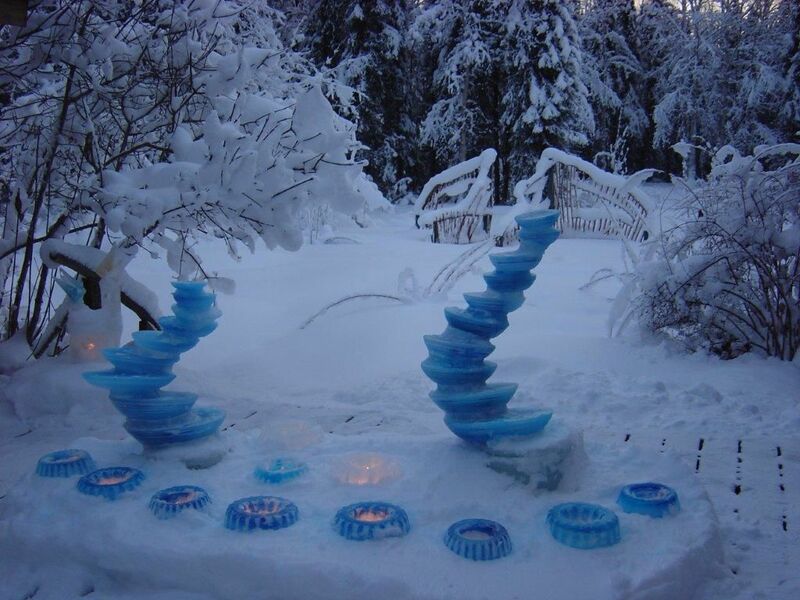 His winter garden is full of ice flowers and fluffy, chilly snow, as shown above. That’s not the kind of snow we get down here. Even a couple of inches of the soggy glop we call snow is enough to wreak havoc in the garden. Not because it’s too cold–that’s seldom cause for concern. Our emerging bulbs won’t be harmed a bit by frost or snow. After all, most of them come from far colder places than this, places like the high steppes of Central Asia, the chilly mountains of Uzbekistan, and the Himalayas. Nothing the Northwest can offer in the way of cold is going to daunt tulips that thrive where humans can barely survive. It’s true that certain flower buds can be blackened by frosts, but in general, the earliest bloomers are hardy creatures. Daphnes and quinces, winter sweet (Chimonanthus) and sweet box (Sarcococca) that are budded up or even blooming now will go right ahead and bloom or keep blooming as soon as the warm chinook melts the snow. Snowdrops and hellebores are unabashed by snow, as are early mahonias and hot pink bergenias. No, the worst thing about snow is the sheer weight of it. Wet snow (our usual lot) is the most dangerous of all. It looks so delicate and lovely, frosting the garden foliage with silvery lace and decking last summer’s plants with fresh, foamy flowers. Hydrangeas are smothered under billowy puffs of white. Taller shrubs are tipped with silver spears, their skeleton leaves newly felted with white. Rhododendrons are bowed down under ice cream scoops of faux/snow flowers. Trees and shrubs arch gracefully under their dainty covering. At least, at first they arch gracefully. Quite soon, though, the strain of carrying that dense, snowy blanket begins to tell. Angles alter, ever more acute, until those woody plants are obviously struggling, pinned down by a powerful opponent. Indeed, that is quite an apt analogy, because snow really does wrestle with shrubs and trees. Their limbs can even be dislocated or broken in the process, and it can happen quite quickly. That’s why it’s important to go around the garden shaking snow loose from mounding shrubs like daphnes and manzanitas and brooms and rhododendrons before they look like they are in trouble. Give a Girl A Girdle? Slim, upright evergreens like junipers and false cedars (Chamaecyparis) are especially prone to snow damage, for their relatively supple branches make such good shelves for snow. Sometimes they simply flop open in an untidy manner, but often whole sections will snap clean off. To prevent this, I’ve often wrapped columnar evergreens in jackets of plastic netting. The kind used to keep birds off fruit trees is usually too small-meshed; the stuff sold for trellising peas and beans, with 4″ gaps, works better. This slightly stretchy horticultural netting comes in various widths, usually 6, 8, or 12 feet. This entry was posted in Uncategorized and tagged Preventing Snow Damage. Bookmark the permalink. great information ann, thanks so much ! I have been reading your Kitsap Sun articles for yrs. Last week you mentioned contacting an arborist to address snow damaged plants, for proper assistance. What I have is, an over 100 yr old apple tree(per Jim Trainor) that needs serious trimming and quickly before it blooms. Who do you suggest? I am not ready to chop down this venerable, gnarly tree. Call Waag Tree Service (http://www.waagtreeservice.com/) or if you want someone who specializes in fruit trees, Ian Bentryn (ianb@whulj.org) is excellent, as is Shaun Swalley (redleafgardenservice@gmail.com 206.380.4308). Good for you for being willing to restore a wonderful old tree!